Once again, I put out the question about another battery build. The votes point to a smaller, lighter pack. Well, on October 04 2017, parts for the second build in the Portable LiFePO4 Power for ham radio series started arriving.. 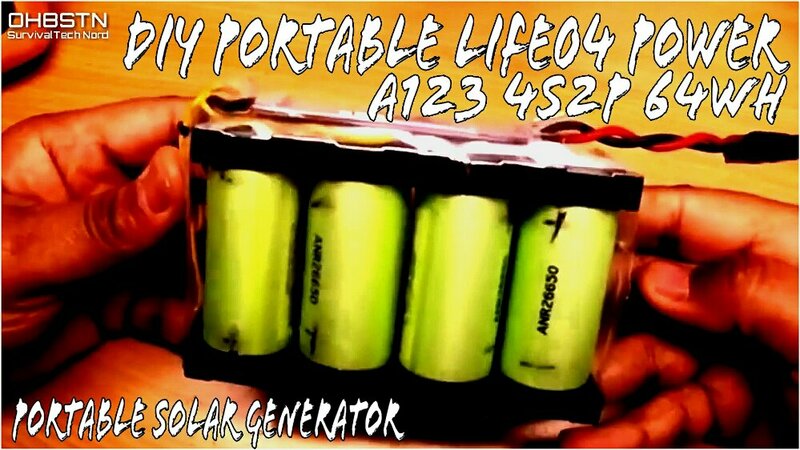 This time we are building an ultra-lightweight 5Ah 4S2P LiFePO4 pack, based on A123 ANR26650 cells. This post will serve as the introduction and episode notes. Who would want to build this? This one will be especially interesting for QRP hikers, SOTA ops, RaDAR Challenge ops, or any operator needing a lightweight pack, which doesn’t take a whole lot of space in a rucksack. Think about the qrp camper/hiker, or a casual operator in the field operating a few hours at a time. An operator who needs renewable off grid power, without carrying something which becomes a boat anchor when its depleted. Like all of the packs we’ve built previously this one can be simultaneously charged and recharged in the field using our solar panels and charge controllers. For me any time I can deploy the PowerFilm is going to be a good day. Here’s an example of a planned trip. In the next year or two I hope to be hiking the Camino de Santiago in Northern Spain. Definitely I want to take amateur radio along on the hike. I expect the hike to take 30 – 40 days to complete. During off days, I’d like to use a rig like my 817, kx2, or mcHF while camping. Since I’m using a hiking trailer, I’ll have a solar panel mounted to the trailer charging up this small battery pack as I hike. This gives me off grid and renewable portable power in the field, topped up each day without the need to recharge using mains power. The benefits are obvious. replenish what you have in the field, no need for the boat anchor. Although batteries are inherently simple to build, having a second cell in parallel means more care must be taken when building this pack. For that reason I’ve removed or reduced the detail of the video and replaced it with a schematic of the pack. if you can’t figure out how to put this back together with the video and the schematic, then I would suggest you start with either the qrp battery pack or they 10Ah LiFePO4 pack, which are much easier to build. There is also the option to build this pack using battery trays. That will simplify the build. and make mistakes much less likely. The battery pack will be in a 4S2P configuration. That means half the capacity of our previous battery pack, but also half the size and less hassle going through airports. Like the 10 amp hour version, we’ll be able to use the Genasun GV-5 mppt charge controller, or whatever charge controller you want to use, provided it’s compatible with 4S lithium iron phosphate pack 14.2-14.6v cccv. The original plan was spot welding the connections of this battery pack. I may want to do a short video on building a DIY spot welder before future builds. For now I’ve decided to go ahead and solder the battery tabs. I’m using two different BMS boards now. The first board you can see in both of the first two videos. The second board is a 50 amp board, meant for the qro field station, or for an operator who’s running much more than qrp power, plus other peripherals like a laptop and some lighting. The pack is put together in series parallel configuration. 4S2P. So we have four modules of two cells. Each parallel set disconnected + to +, – to -. Bad things will happen if you connect plus minus plus minus on a parallel set! Getting the hang of soldering the battery tabs was difficult at best. If this is your first time doing it I would suggest doing with someone who has excellent experience and soldering skills do sit there with you while you do it. The trick is being certain to heat the end of the tab fast enough and hot enough, without heating the battery itself. This requires a large tip and temperature conttolled iron. One alternative to soldering is using the battery trays similar to ones used in the qrp battery project. Using the trays will make the battery a little larger, but soldering those trays is much easier than soldering the tabs of the batteries. Another alternative is getting someone with more soldering experience to do some hand-holding with you while you build pack. This is my preference! The final alternative is buying a battery spot welder from eBay. I’m definitely going to invest in a battery spot welder in the coming months. We do so many portable power Builds on the channel, I think I should promote the idea of building these 18650 and 26650 packs correctly. One of the build options is using trays rather than soldering the tabs on the cells. I’ll finish this section in a day or two.